Smoke Damage Claim. Does Homeowners Insurance Cover this Damage? 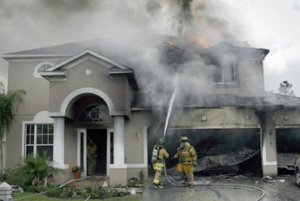 Have you had a recent fire in your home or business that you were able to put out quickly? As it turns out, even if there were no obvious burnt areas from a fire, there is a good chance you have associated smoke damage. Smoke damage includes soot, ash, and odor. When there is a fire, smoke will go EVERYWHERE in your home or business. If you have a fire in one room in your property, smoke damage could be present in other parts of your property as well, even if you don’t see it. Smoke permeates into almost all materials including drywall, carpet, upholstery, bedding, clothes, cabinetry, etc. Additional Smoke damage can occur in minutes when the AC carries it throughout your house! Since smoke is obviously airborne, it may be carried by your air conditioning system all over your house, causing multi-room damage, resulting in an even greater loss than you may be aware of. Because of this, it is important that you consult with the right expert when it comes to maximizing your insurance settlement. A public adjuster with the proper training may be the right place to start. Although your insurance policy covers you for this type of damage, it is not uncommon for your insurance company to limit their exposure by selectively scrutinizing the damages. You know your home. You know how it smelled before the smoke infiltrated into every crook and cranny. There will be items in your home which will need to be removed and thrown away, even though the item looks undamaged. I encourage you to call my office for a free inspection. If there is anything I can do to help you, I will let you know. Either way, you will walk away with knowledge and a better understanding of how you should proceed.